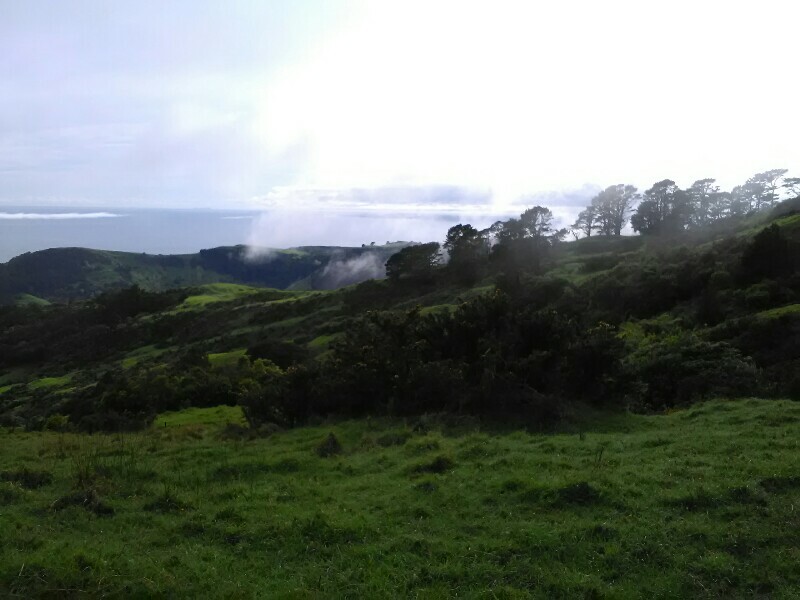 It was while hiking along Ocean Beach a few days ago, when I was thinking about the bush and forest tracks, especially the Northland and Morepork Forests. They where hard work, technically challenging and the progress was so slow I got really angry, even depressed at times. I think I simply underestimated these parts. Thought they'd be easier. A little further down the beach, I recognized that I have to change my attitude towards these challenging hikes. Accept the slow progress, set realistic goals. I have time, plenty of time to complete TA, so take it step by step. No need to hurry. Today's hike is basically all in forests. Except for some short road walking at the beginning. Always nice to start with a bit of road walking, as it gives my body the possibility to warm up a little before hitting the trail. And what a trail it is! 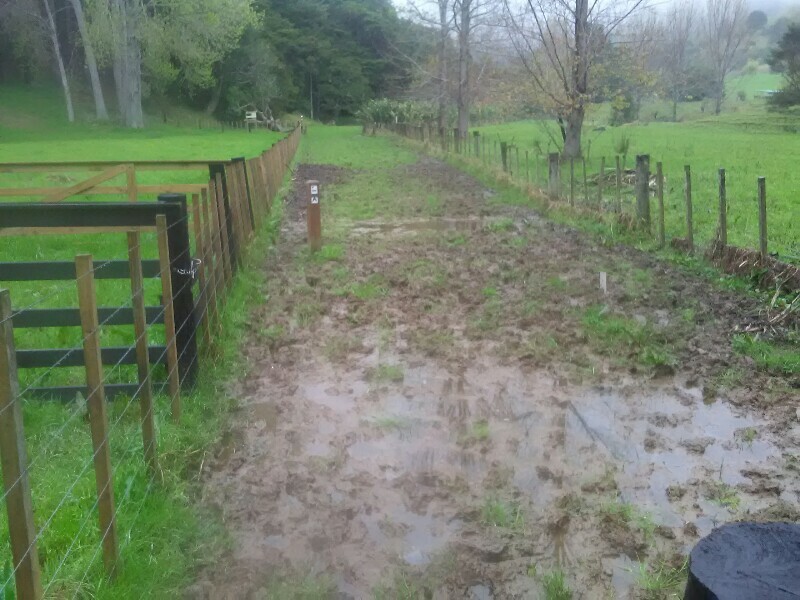 The very first steps already in ankle deep mud, before climbing steeply up through pastures. Once on the ridge it gets really muddy, I dare to say similar as Raetea. It's a continuous up and down but it's technically not really difficult (with a few exceptions) and with my Injinji socks, which I try out today, surprisingly grippy. They perform way better than the Tabus! At the top of Tamahunga, there's a Helipad. Perfect for a quick rest. Romain, with his light pack and trail runners flies past. I was sure he'd catch me. At the same time, I receive a text from Matt, who I met at Ocean Beach. He invites me for dinner and I can spend the night at his place near Orewa as well. How great is that! With this in mind, hiking goes a lot easier, even in deep mud. At one point I slip and tumble a few meters over roots, twisting my right foot. Luckily only some bruises, nothing else. But it shows how fast everything could be over. I catch Romain again just before entering Dome Forest. It's now 1pm and the State Highway is 6 hours away (according to the info board). Hmm... If the hike is not too technical, there's a realistic chance to make it through Dome Forest today. That would be awesome! 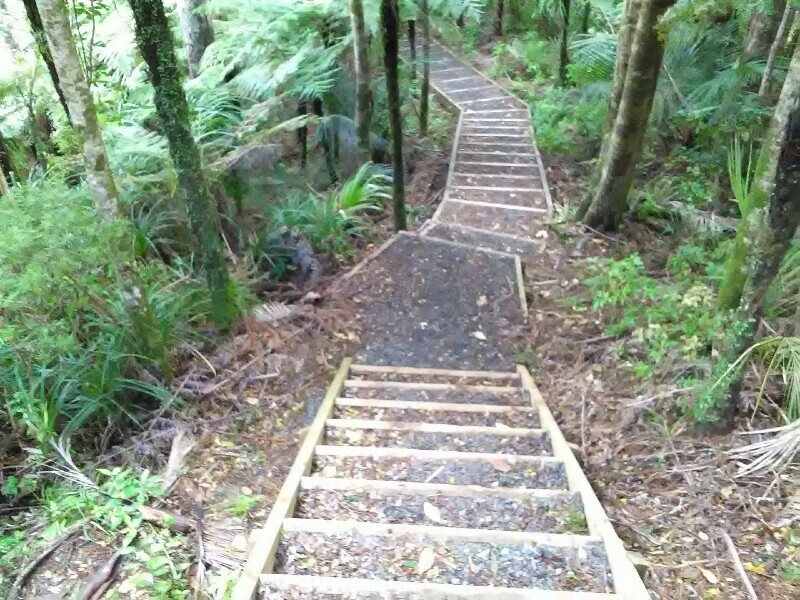 Progress is initially very good but as the trail gets steeper, it slows me down considerably. If I make it to the Dome Peak before six, I'd head for the Highway (from the Dome it would be an enhanced walkway all the way down). Otherwise, I'd camp somewhere up there. Shortly after 5 I reach the peak. Much earlier than anticipated and a little confused as, according to the trail notes, there would be some no rock scrambling before reaching it. But there wasn't any... I only realize it when I scramble down over rocks a few minutes later that I misread the notes and mixed up the peak with the observation platform. Silly me... Well so it's another km through the mud before I reach the platform and head down the steps from there to the Highway and the Dome Café, which is already closed. What a pity! At least I manage to wash my feet and legs before continuing along the road. Probably my hardest day so far. Legs and feet extremely tired. The good thing however: Nothing hurts! Well, I think I was able to change my attitude a little today. Not at all times but here and there. And I have to admit: it makes the hike so much more enjoyable!